Requires Windows and .NET 3.5 or higher (your PC probably already has it). One week trial version. After expiry, software can be used for free in exchange for sharing PC resources (see history for details), or alternatively by paying $5. 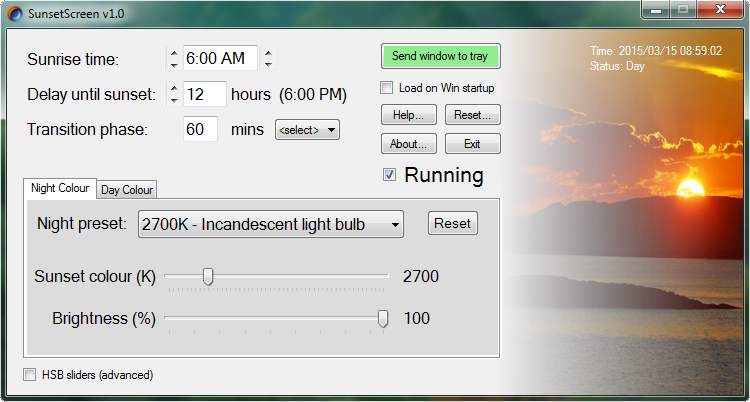 SunsetScreen is a Windows app which helps take the glare off your your screen in the evening. Scientific research has shown that melatonin - the chemical the brain makes late in the day - is reduced when exposed to blue light. By tempering this blue light, it becomes easier to wind down properly at night, and thus have a more restful sleep. Terms of service available here. 2018-12-04: v1.30 - Fixed startup issue with Windows. Also implemented trial version (I have to eat too :( ). Either upgrade after a week by paying $5 for the full version, or agree to the integrated peer sharing system to use Sunsetscreen for free (can be disabled at any time). If you accept, your use of SunsetScreen is free of charge in exchange for safely using some of your device's resources, and only when you are not using your device. You may turn this off from the Options window and no user data is ever collected. Please see our TOS for further information. 2018-02-27: v1.28 - Startup alternative made simpler. 2018-02-22: v1.27 - Startup problem loading prefs fixed. Also now there's an alternative way to have SunsetScreen on boot if the default way didn't work. Finally, you can now donate via Paypal, Bitcoin, Ethereum or Nano if you find SunsetScreen useful! Click the donate button in the main program to see the addresses. 2017-07-10: v1.26 - New certificate signing implemented and added disable mode for day/night. 2016-08-28: v1.25 - Fixed fading issue on last day of each month. 2016-06-10: v1.24 - Added invert day/night mode and fixed display of "Expand colour range" if already expanded. 2015-08-21: v1.23 - Windows 10 compatible, and new 'Hide on manual start' option. 2015-07-09: v1.22 - New 'Invert colours' mode - perfect if you need the darkest screen possible. 2015-06-16: v1.21 - Fixes memory error message on some systems if you tried to log off Windows and on again. 2015-05-06: v1.20 - On some systems, the colour of the screen would return to normal white after a UAC prompt, or PC unlock occurred. This should now be fixed. SunsetScreen should also now have full support for multiple monitors. Extra features include new and improved custom hotkeys functionality, Options window, and numerous tweaks. 2015-03-29: v1.18 - Fixed 'bug' which may cause a slight, but noticeable flicker for some users. This was originally added to act upon any unforseen changes back to the default screen's colour from the OS, but affected systems are relatively rare. See the docs though if you find the screen occasionally goes back to default (when it shouldn't) as you can set the 'periodicallyUpdateScreen' parameter to true to bypass this problem. 2015-03-29: v1.17 - Fixed bug which may prevent the return to normal screen colours after exiting SunsetScreen. Also added tray menu item to turn SunsetScreen on/off. Finally, because of the maturity of SunsetScreen, by default, "Load on Win startup" is now ticked. 2015-03-28: v1.16 - Keyboard shortcut to turn on/off SunsetScreen. Also included masterBrightnessIncrement setting for power users. 2015-03-28: v1.15 - Minor GUI tweaks and disabling of keyboard shortcuts until colour range has been expanded to reduce potential confusion. 2015-03-27: v1.14 - Added keyboard shortcuts Alt+PageDown and Alt+PageUp to control the brightness independently of the main app's controls. Also, 4100K Moonlight is the default colour temp on first use now. Reinstalling the app will now automatically close the older version. 2015-03-25: v1.13 - Closing the app with the standard close button keeps SunsetScreen active. You can still close the app with the Exit button if you wish. 2015-03-21: v1.12 - Thanks to everyone who has helped support SunsetScreen with suggestions and error reports. Bug fixes in this release are: Easily resetting Windows XP is now possible without closing the program first. The button to reset that current colour to default is now called "Default" instead of "Reset" to differentiate it from the main "Reset..." button. 2015-03-20: v1.11 - Minor tweaks and fixes. The 12-hour clock format is now default again. 2015-03-20: v1.10 - Big bug fix to solve crashing when changing to sunset/sunrise in many countries. Editing a single line of code did the trick. I can also now reproduce the errors on my setup, so if any future errors do crop up (which I doubt), I'll be onto them in minutes. Also fixed crash when trying to change the Delay until sunset (which only appeared in 1.05). 2015-03-19: v1.05 - Has 24 hour mode option (default) and is more compatible for worldwide usage. 2015-03-18: v1.04 - New 'Info' checkbox which displays more detailed information should you choose. Also overhauled system for expanding the colour range (until you do, certain options are now greyed out or restricted for sanity's sake). Finally, colours are more numerically precise. 2015-03-17: v1.03 - SunsetScreen now allows you to select ALL colours including darker shades. Simply look for the bright orange button that will appear when you try, click it, then click Yes to the prompt, and then reboot, and voila. 2015-03-17: v1.02 - Switched default mode to "Cool Incandescent" whilst I figure out a way to allow Windows 8+ to support darker screen modes. 2015-03-16: v1.01 - Preferences are autosaved after controls are changed (before, you needed to manually close SunsetScreen for it to save). 2015-03-15: v1.00 - First release!